Chondria dasyphylla, copyright Ignacio Bárbara. Chondria is a genus of much-branched Rhodomelaceae with distinct pericentral cells throughout the thallus and flat spermatangial plates (Womersley 2003). Characters (from Womersley 2003): Thallus usually erect, rarely prostrate or free-floating, much branched irregularly radially or unilaterally, rarely subdistichously, with or without one to a few percurrent axes; a few species with tendrils, axillary branches often present; branches terete or compressed, young branches basally constricted. Some species with swollen, bulbous, sterile storage organs. Attachment by discoid holdfasts or haptera from stolons; epilithic or epiphytic. Structure. Apices of branches depressed or rounded, or tapering, with an apical filament usually 10–20 cells long, the subapical cells cutting off 5 pericentral cells in alternating order and branched trichoblasts. Pericentral cells of similar length to axial cells except near apices of tetrasporangial thalli, producing 2–5 series of di- to quadrichotomous branchings, expanding rapidly to form the rounded ends of branches; pericentral cells remaining clear throughout the thallus, cortex of compact, ovoid cells with the epidermal cells ovoid or angular to elongate in surface view. Pericentral and often the inner cortical cells of most species developing wall thickenings of various forms often characteristic of the species. Rhizoids usually formed from pericentral and inner cortical cells, sparse to dense around these cells in larger branches. Secondary cortex absent or present on the lower axes by proliferation of the epidermis. Reproduction: Gametophytes dioecious. Procarps borne on a lower cell of trichoblasts, with the fifth-formed pericentral (supporting) cell bearing a 4-celled carpogonial branch and lateral and basal sterile cell groups; auxiliary cell cut off post-fertilization or in some species the supporting cell acting as auxiliary cell. Carposporophytes with a basal fusion cell and branched gonimoblast with clavate terminal carposporangia, replaced from lower cells. Cystocarps ovoid to slightly urceolate, in some species with a basal spur developed from trichoblast cells above the supporting cell; pericarp ostiolate, with 9–18 erect filaments arising pre-fertilization from adjacent pericentral cells, each cell with 2–3 outer pericentral cells and ecorticate or not. Spermatangial plates flat, discoid or slightly lobed, developed from the whole or a basal branch of a trichoblast, with the primary cells producing a layer of initials each cell of which cuts off 2–4 spermatangia, and with a sterile margin 1–3 cells broad. Tetrasporangia developed in lesser branchlets, cut off singly from near the outer ends of 1–3 radially elongate pericentral cells per axial cell, covered by the outer cortex and epidermal cells. [W03] Womersley, H. B. S. 2003. The Marine Benthic Flora of southern Australia. 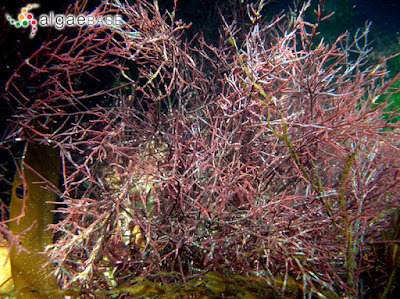 Rhodophyta pt IIID. Ceramiales—Delesseriaceae, Sarcomeniaceae, Rhodomelaceae. Flora of Australia Supplementary Series 18. Australian Biological Resources Study: Canberra, and the State Herbarium of South Australia: Adelaide.